On this shining edition of Talk it Over, we've got stuff to talk about and we are talking... about: The cranky, bronze medalist, The Preacher's Wife vs. The Flight Attendant.Â Â And we tackle such meatyÂ issues as: Should the 91 year old grandmother be dating the 70 year old gold digger?Â Teenage Dating Dilemmas, and is 150 too many cats.Â Join us, won't you? 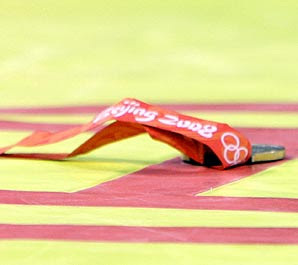 Swedish wrestler Ara Abrahamian threw away the bronze medal he won in disgust over judging in his semifinal bout. He was later awarded the gold in bad sportsmanship.